The Thermocompressor, also a type of Jet Compressor, is used when both motive and suction gases are steam. Thermocompressors have automatically-controlled spindles. They are used when pressure suction or discharge conditions vary and it is necessary to control discharge pressure or flow. 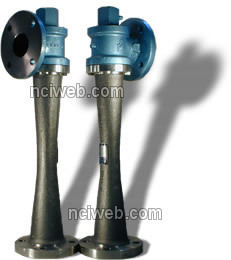 Thermocompressor spindles are designed to act as temporary valves and provide tight shut-off. Thermocompressors are available in materials to fit operating conditions or as specified by the customer. Fig. 420 Jet Compressors are flanged and have no regulating spindle. The pressure connection is threaded, the suction and discharge connections are flanged, and the nozzle is threaded into the body for easy removal and maintenance. The Fig. 425 Jet Compressor has all threaded connections and is equipped with a manually-controlled spindle which is used specifically when the unit operates at a steady load but where flexibility of the nozzle orifice is desired to compensate for changes in operating conditions. The Fig. 427 Jet Compressor is the flanged version of the Fig. 425. Fig. 426 Thermocompressors have automatically-controlled spindles. The spindle can be operated with a diaphragm, piston, or motor actuator using any standard instrument signal, either electric or pneumatic. The Fig. 439 Thermocompressor is the threaded-connection version of the Fig. 426. Fig. 420, Fig. 425 and Fig. 427 Jet Compressors have no moving parts. They can be manufactured from any machinable or castable material. Large units can be fabricated from any materials which are available in plate and are weldable. They can be installed in any position. Due to velocities involved, good mixing of dissimilar gases is obtained. Jet Compressors can replace mixing valves and at the same time boost pressure which replaces a compressor. Jet Compressors can reduce boiler steam demand or enhance the capacity of an existing boiler. Fig. 426 and Fig. 439 Automatic Jet Compressors can be used in applications operating over a range of pressure and differential pressure. Automatic Jet Compressors may be utilized wherever available energy is being lost through reducing valves; such as high pressure steam reduced and desuperheated for process use and mixing of gases without use of mechanical compressors. Diaphragm and piston operators use any standard split or full range, electric, electronic, or pneumatic instrument signal. The control can be activated by temperature, pressure, flow, or suction to motive gas ratio. Jet compressors are simple in construction, have no rapidly rotating parts to break, get out of order, adjust, or replace. Jet compressors can be made from practically any machinable material-cast iron, bronze, special stainless steels, etc. Since they require little attention, they can be install­ed in remote locations. These compressors can be used in potentially ex­plosive atmospheres without additional safeguards because they have no electrical components. The jet compressor not only performs the primary function of compressing and mixing gases but, in addi­tion, it takes the place of a reducing valve and salvages much of the energy lost in the reduction of operating­ medium pressure. Compared with other types of equipment, jet com­pressors are very low in original cost and in upkeep. Types and sizes of Jet Compressors are listed in the following pages. Types include the following: fixed ­nozzle type compressors; compressors with manually­ controlled spindle; compressors with automatically­ controlled spindle. Fixed-nozzle type jet compressors are suitable for ap­plications as noted where conditions are such that no controls whatever are required, or where use of several compressors in parallel will permit an adequate degree of control. Normally, some form of flow regulation is required.